HMNZS Taupo departs for Fiji on Operation Wasawasa. New Zealand navy patrol vessel, the HMNZS Taupo, is expected in Suva this week to spend the next three months conducting maritime patrols in Fiji. 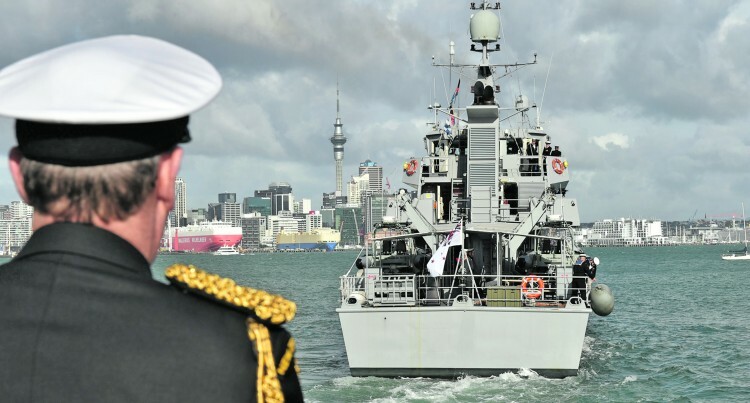 HMNZS Taupo, a protector-class inshore pa­trol boat had left Auckland on Monday for Suva. HMNZS Taupo was delivered to the NZ Ministry of Defence on the May 28, 2009 and commissioned into the Royal New Zealand Navy on May 29, 2009. This is the second consecutive year that the New Zealand Defence Force is helping Fiji pa­trol its Exclusive Economic Zone of over 1.1 mil­lion square kilometres. According to NZ Defence Public Affairs Phil Murray, the naval vessel due to arrive this week will also provide training for Republic of Fiji Navy personnel while stationed in Suva over the next three months. “Last year, about 50 Fiji Navy sailors, 27 Customs Officers and 19 Fishery Officers trained on inshore patrol vessel HMNZS Hawea,” Mr Murray said. Patrols by the HMNZS Taupo will involve compliance monitoring activities, which in­clude two Fishery Officers from New Zealand’s Ministry for Primary Industries assisting with boarding and inspection of vessels. “At the request of the New Zealand Defence Force and supported by the Fiji Ministry of Fisheries, the Ministry for Primary Industries will support the operation with senior fishery officers,” he said. “The MPI senior fishery officers will provide support with at-sea boarding and inspections of fishing vessels and provide assistance when requested. The MPI senior fishery officers have significant experience with commercial inshore, offshore fisheries and customary fish­eries, which aligns with Fiji’s objectives for the operation. “It is important to note that these maritime patrols are combined operations between the NZDF and the Republic of Fiji Navy. “Personnel from Fiji Ministry of Fisheries, Fiji Revenue and Customs Authority, and the Republic of Fiji Navy will plan and lead the pa­trols. About 550 vessels were boarded and 110 al­leged infringements detected during the com­bined maritime patrols with Fiji last year. The Commander Joint Forces New Zealand, Major General Tim Gall, told Radio New Zealand that the combined maritime surveil­lance operations with Fiji would help ensure sustainable management of regional fishery resources. “We also expect the patrols to deepen col­laboration between New Zealand and Fiji Government agencies and strengthen defence cooperation between the two countries,” Major General Gall said. Royal New Zealand Navy Captain Dave McEwan, the Maritime Component Commander, said learning was a two-way process and the New Zealand sailors learnt as much from their Fiji Navy partners. “We hope to replicate the success of last year’s combined patrols and contribute to Fiji’s mari­time security,” he said. The Royal New Zealand Navy has two offshore patrol vessels – HMNZS Otago and Wellington – and four inshore patrol vessels – HMNZS Hawea, Taupo, Pukaki and Rotoiti.